As an avid Manchester City Football Club supporter, Noel Gallagher was asked by Coleen Rooney, wife of Manchester United star footballer Wayne Rooney to sign a guitar for her husbands 22nd birthday. As Noel explains n the video below, he and Oasis guitarist Gem Archer took pride in repainting the £2,000 tiger flame, cherry sunburst Gibson Les Paul Classic. They had the guitar painted in sky blue paint and wrote out the chorus of Manchester City anthem Blue Moon. Noel then wrote “Happy Birthday Spongebob” signed Noel Gallagher. 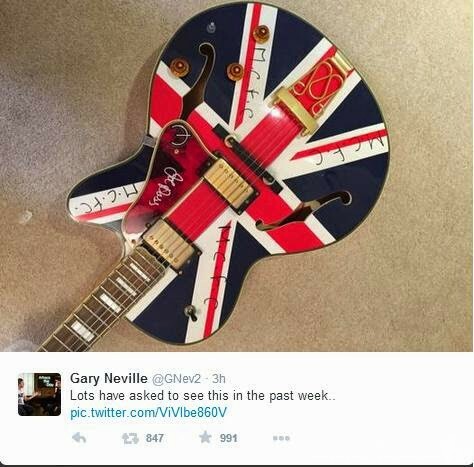 Is it true Noel Gallagher sent you a guitar for your birthday? 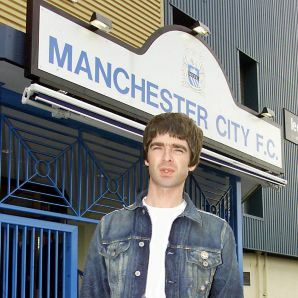 Here’s a radio clip of Noel with Russell Brand talking about the Wayne Rooney guitar and how Wayne got back at him by beating Man City with a goal and sending Noel an autographed photo of him scoring the goal.